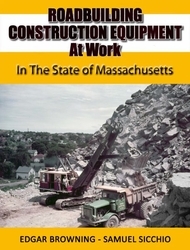 Author Edgar Browning’s seventh pictorial review of highway construction, co-authored by Sam Sicchio, covers the Bay State. Chapters cover the nearly forty different contractors, both headquartered in Massachusetts and from out of state, at work on the Mass Turnpike, Central Artery Project and other major projects. Also includes discussion of road construction in 1803 through 1805! 147 pages, softbound, 222 B&W and 12 color photos.